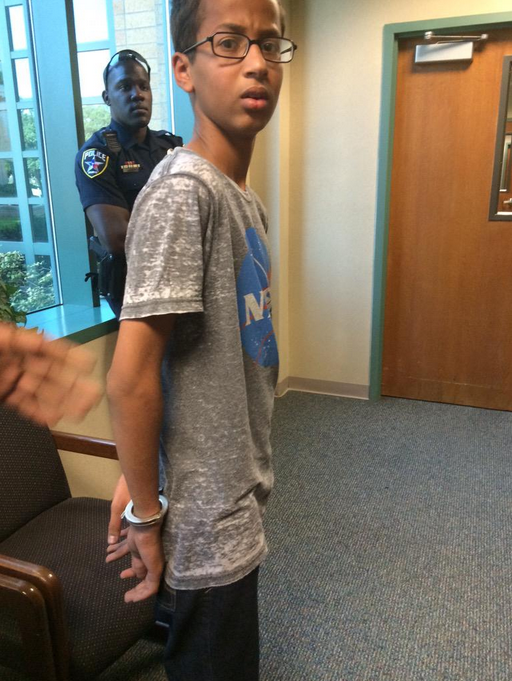 Ahmed’s clock, pic from the Irving police (via Wired). He suspected that he wasn’t going to get it back, but he probably didn’t expect to get interrogated, intimidated by his principle, and then led away in handcuffs. For making a clock. Ahmed being led away in handcuffs. Thats’ a NASA shirt he’s wearing, by the way. Very ominous, am I right? At a press conference today, a police spokesperson claimed that the device was both “a hoax bomb” and a “naive accident.” That position makes no sense. A hoax is a deliberate attempt to deceive people. An accident is not. Which is it? Given that Ahmed’s behavior it is obvious to any sane human being that it’s really neither. It’s just a talented kid who wanted to show something cool that he’d made to his teachers. The outrage factor on this one is high, and–while I admit I’m seething–I’d like to step back from just shouting at stupid people doing stupid things because they are stupid. That’s not productive. What might be instructive is this article from Gawker: 7 Kids Not Named Mohamed Who Brought Homemade Clocks to School And Didn’t Get Arrested. So: Let’s not pretend that Ahmed’s name is not irrelevant here. Obviously it is. So. “If you see something, say something.” The problem with vigilance is that if you don’t know what to be vigilant for you’re not actually being vigilant. You’re being paranoid. His English teacher was scared. What does his English teacher know about explosives? Or electronics? Not much. The police were scared. One said, “It looks like a movie bomb to me.” Clearly we’re dealing with professionals here. I know I’m veering into sarcasm again, but there’s a sincere point I want to make. Prejudice obviously played a role in this case, and prejudice obviously plays a role in a great deal of the injustice that happens in our world. But prejudice alone doesn’t explain everything. What happened in Irving took prejudice but also ignorance and especially fear. Fear and ignorance are catalysts that exacerbate underlying prejudices. I’ve written about fear a lot recently, once in the specific context of refugees and migrants and more generally when it comes to security and safety. The message in both cases is pretty similar. First, we need to be willing to assess risks rationally to the best of our abilities. Second, doing the right thing means confronting fear. There is no progress without a general willingness to take risks. They come down to the same thing: don’t let fear be in control. So, in addition to our conversations about prejudice, it might help to also have a conversation about basic bravery. About setting aside our worship of fear. When 9/11 happened, it made the country better in a lot of ways: it brought us closer together (for a while, at least), it focused our priorities on what really matters (for a while, at least), and it reminded us of what real heroism and sacrifice look like (we seem to be doing a better job of remembering that one). But it also had some dark effects, and those effects are lingering stubbornly. Chief among them: it taught us a new kind of fear. That fear has already convinced us to trade away an awful lot of money, an awful lot of lives, an awful lot of our principles, an an awful lot of our civil liberties. We’ve spent an awful lot of time–individually and as a nation–being motivated by aversion. By fear. Maybe it’s time to change the motivation. They say that we should never forget 9/11, but I think that depends on exactly what you’re trying to enshrine in memory. If you’re talking about the sacrifices and bravery of first responders and the folks on Flight 934, then of course we all agree. But maybe there’s more we should remember, like what it was to be an American on 9/10, before our national psyche was scarred. I think there were some things we did better then. Like not overreacting to some poor geek5 and his harmless hobby just because his name is Ahmed. We can’t just turn the clock back. We can’t literally forget, and we shouldn’t. But if we can get back even a little bit of that openness and confidence it will mean something. Because this time it we will be choosing openness and confidence and bravery in spite of fear rather than merely stumbling into them. Let’s recognize prejudice for what it is and fight it. Let’s do the same with fear. The biggest problem I have is the response from some people who are advocating what was done as the right way to handle it. That the clock was a test to see if they could get bombs into schools. The hatred and vitriol is astounding, and disheartening. One would think and hope that those most likely to stand up for rule of law everywhere else, would realize how hypocritical and self defeating it is to push for ignoring the law here. What was done to this young man was wrong on so many levels. Be suspicious, ask questions, check to make sure….yeah I’m fine with that. Suspending him, having him arrested and interrogated without his parents or a lawyer present? Not so fast. He was suspended for….a clock. Arrest him for a hoax bomb? Doesn’t one have to make some type of indication that it’s a bomb first? This has all kinds of the wrong way to handle suspicions written all over it. At this point, I’m seriously saddened by the reactions some people are providing, I’m ready to get off this bus and try living somewhere else, with less idiots. Tying together two recent thoughts: The Martian is inspiring precisely because it’s a relief from the psychological aftermath of 9/11. That the clock was a test to see if they could get bombs into schools. Wow, had not seen that yet. Not surprising, though. In a world where we’ve got conspiracy theorists going on about “crisis actors” after school-shootings, the idea that someone could imagine this was all a nefarious plot (against Irving, Texas!!?!?) is absurd…but not surprising. The problem, sadly, is that in life good and bad do not cancel out like positive and negative numbers. I’m really, really happy that folks are showing him support, but it doesn’t actually make the harassment go away. Another great one, this time from Boing Boing. If the above article is correct, your picture labeled as ‘being led away’ is actually ‘staged at the police station’. What I’ve since read actually does bring back within normality some of what was done, but still begs the question: If they really did think it was a bomb, why didn’t they evacuate the school? Because they didn’t think it was a bomb, but they were concerned that it might have been specifically made in that manner, especially when he supposedly stopped responding to their questions about it’s intent, and if he brought anything else. Then again, they have the right to search his stuff on school grounds, so why didn’t they just do that instead of playing games with him asking questions and not getting answers? So apparently he wasn’t ‘interrogated’ for hours without a lawyer or parents. Or at least, that part is being called into question as this plays out further. This could also turn out to be very embarrassing for all the grown up geeks and the WH if it’s true. A notable example, in case you’d like a refresher, would be the Georgia county that refused to pay medical costs after police dropped a stun grenade in a toddler’s crib and blew a hole in his chest. This is par for the course, folks. There are other approaches to combating prejudice, and some are better than others, but all are going to face this problem when put into practice. This can be taken too far, obviously, but I like it as a general approach. And I think that’s usually what people mean. I say that as a geek.